Advanced controls that can customize ventilation based on the number of people in a room are expected to translate to big energy savings. 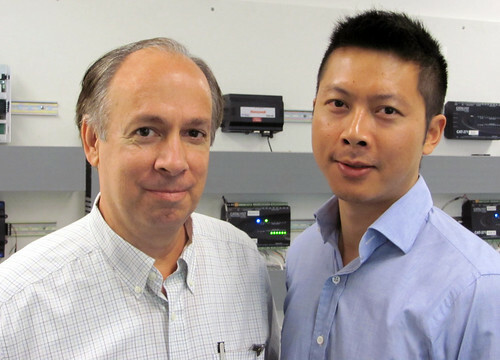 Michael Brambley and Guopeng Liu in PNNL’s Building Controls Laboratory. RICHLAND, Wash. — A single advanced building control now in development could slash 18 percent — tens of thousands of dollars — off the overall annual energy bill of the average large office building, with no loss of comfort, according to a report by researchers at the Department of Energy's Pacific Northwest National Laboratory. "An 18-percent boost in building energy efficiency by modifying a single factor is very, very good," said team leader Michael Brambley. "The savings were much greater than we expected." The report is based on extensive simulations of the impact of one type of advanced building control now in the offing in the building industry. The device is capable of customizing the level of ventilation by sensing the number of people in different areas or zones of a building and then adjusting fan speed and air movement accordingly. That's a big change from the way most sensor-based ventilation systems operate now: Currently, if there is even a single person in a room, ventilation runs full blast, as if the room is full. But a room with just a few people doesn't need nearly as much ventilation as a crowded room. Why have a fan pushing around air for ventilation for 100 people if there's only one individual in the room? It's like airing out your house completely because there's one small whiff of bacon still in the kitchen. "This is the reason you often feel cold when you're in a big space like a conference room or cafeteria without a lot of people," said engineer Guopeng Liu, the lead author of the report. "Technology available today doesn't detect how many people are in a room, and so air flow is at maximum capacity nearly constantly. That creates a big demand to re-heat the air before it enters the rooms. It takes a lot of energy to keep you comfortable under those circumstances." Current occupancy sensors have helped the nation save significant amounts of energy by automatically turning off lights when they're not needed. But the team estimates that the more advanced versions still to come — which count the number of people in rooms — will save approximately 28 times as much energy, when used both for lighting and ventilation, compared to current sensors. The project began three years ago when Liu began exploring the idea of adjusting air flow to different zones of a building based on the precise number of people in a room. That "decision" of how much air to move takes place in a piece of equipment known as a variable air volume terminal box. The new sensors that count people are likely to become available within the next few years. While they are currently very expensive, the technology is improving rapidly and the cost is expected to come down, Brambley noted. "We undertook this study to try to determine if this is a technology worth pursuing vigorously. The answer, clearly, is yes. Using the number of people in a room as a factor in determining the level of air flow offers great promise for saving energy and money," said Brambley. To do its study, the team focused on a prototypical large commercial office building whose footprint is 160 feet by 240 feet — about 80 percent the size of a football field. The model building is 12 stories and also has a basement, giving it a total of about 500,000 square feet. Such buildings in the United States take up more than 4.4 billion square feet. To visualize the size, think of the land area covered by Seattle — and a little bit of its suburbs — as a giant one-story building. Brambley's team programmed the simulation to heat a building if temperatures dipped below 70 degrees Fahrenheit and to provide cooling at temperatures beginning at 75 degrees. Numbers were set back 10 degrees on the evenings and weekends. Occupancy patterns were estimated based on past studies. In 13 of the nation's 15 climate regions, the PNNL team estimates that the advanced controls would save at least $40,000 annually for each building similar in size to the one modeled in the study. In two cities, Baltimore and Fairbanks, the savings stretch to more than $100,000 each year, because of the greatly reduced need to heat new air being pumped in from the cold outdoors. Even in the two cities where the savings would be the least, El Paso and Miami, estimated savings come to $33,400 and $23,500, respectively. "While buildings have gotten much more efficient in the last two decades, there are still huge gains to be had," noted Brambley. Since just a small percentage of office buildings in any given year are newly built, Brambley and Liu say a prime target for these advanced controls is retrofitting existing buildings. Liu notes that technology has leaped forward since 1989 — the year the average large office building was built - offering huge energy gains even with the expense of retrofitting. Since heating and cooling and related equipment usually draw much more energy than lighting, those systems offer a greater opportunity for savings. 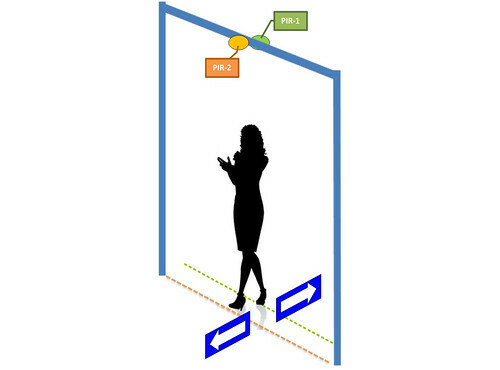 The team found that advanced controls for ventilation offer about eight times as much savings as advanced controls for lighting, where lights are turned off more quickly than is now common after everyone leaves a room. When the HVAC (heating, ventilation, and air conditioning) system alone is considered, the advanced controls cut energy usage of the HVAC system by nearly 40 percent. A stumbling block to the new technology is that certain advanced controls might require modification to some building codes. For instance, current codes require some ventilation at all times no matter how many people are present. Brambley thinks the options are worth considering, given the energy savings at stake. In addition to Brambley and Liu, mechanical engineer Jian Zhang and engineer Robert Lutes contributed to the project. The work was support by DOE's Office of Energy Efficiency and Renewable Energy. Reference: J. Zhang, R.G. Lutes, G. Liu and M.R. Brambley, Energy Savings for Occupancy-Based Control (OBC) of Variable-Air-Volume (VAV) Systems, funded by the U.S. DOE's Office of Energy Efficiency and Renewable Energy, through the Building Technologies Program.